The Sunset Grill story is quite simple. 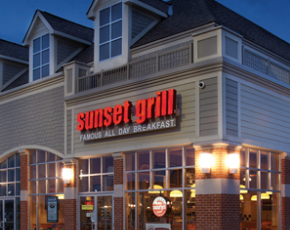 In 1985 founder, Angelo Christou, opened Sunset Grill’s doors for the first time in the Beaches area of Toronto, Ontario. Armed with the basic philosophy that Fresh is Tastiest™, Sunset Grill quickly developed long lineups of loyal customers. With huge popularity and consistent service, it quickly became the place to be for the best breakfast in town. It is said that when something works, don’t change it. After more than 30 years in business, we realize that while the world around us has evolved, our concept and methods have not changed. After all, good food, fast service and a pleasant experience is what a successful restaurant is all about. Our food and preparation methods are 5-star inspired and quality is never sacrificed. All our menu items are cooked fresh to order using healthy methods: flat top grills, pat dry bacon and nothing is ever deep fried. With choices such as our famous bacon and 3 eggs for breakfast or our flagship Sunset Burgers for lunch, we invite you try our restaurants for an experience you can count on!